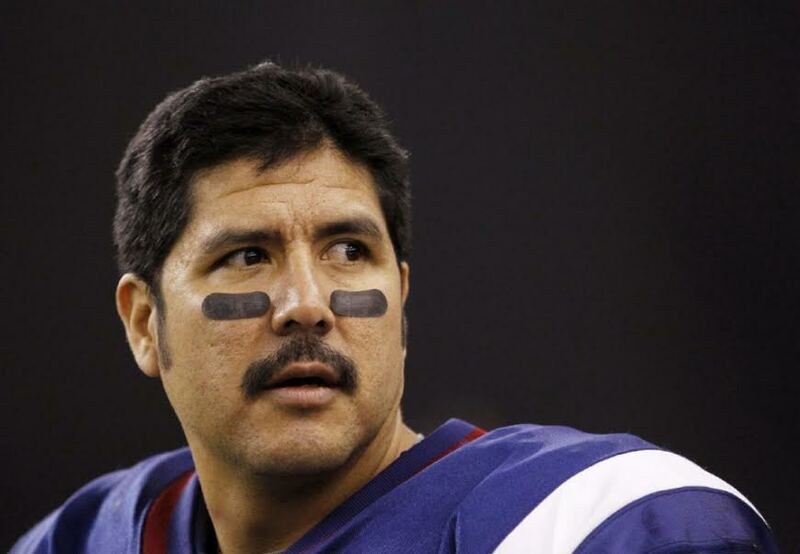 I have yet to meet an American who even knows the name Anthony Calvillo. And only the rare American journalist, like ESPN's Chris Berman, knows his name. Matter of fact, Berman correctly acknowledges Calvillo as the top passing quarterback in the history of professional football. Number One. Just ahead of that Peyton Manning fellow. In 2011, Berman devoted his 2-minute drill segment to Anthony Calvillo, recognizing him as having surpassed Brett Favre at the time, and describing him as a “Montreal civic treasure.” The video, full of classic Chris Berman Quebecois schtick, is still on YouTube, and is worth a watch. Especially for you America dudes who think you're really, really smart about football. Yes, Anthony Calvillo is the top passing quarterback in the history of professional football, with 79,816 yards. I love cold, hard statistics, and that number is absolutely ridiculous. Just a few more tosses to Cahoon and you'd hit 80,000 yards? Are you kidding? I didn't realize Joe Montana and Johnny Unitas had such paltry 40,000-yard careers. This combined with a 20-YEAR career (a pro football Old Folks Club with only a handful of members with names like Blanda) definitely drives Calvillo into Maslow territory. (And in this conversation, I have no desire to debate the purist NFL fans about the merits of the CFL. Not the place, and not relevant. This piece is about excellence, and the featured gentleman here is the poster-child for pure and utter excellence). Anthony Calvillo, for a big bucket full of reasons other than gridiron exploits, is the prototype of what I call a complete Maslow guy. Obviously, I deeply admire Mr. Calvillo, but not just from watching him play for my Montreal Alouettes. Indeed, having moved to the Seattle area in 1983, and becoming one of those crazy Seahawks fans, I just didn't follow Canadian football that much anymore. I watched the odd game and a few Grey Cups on TV, but not to the extent of the good ol' Johnny Rodgers, Marv Levy, Mark Kosmos days I followed so rabidly in the '70s. To get the feel of this quarterback's impact on the city of Montreal, I relied on my brother, and my old football buddies back there. Much like the love Seattle has for Russell Wilson, all raved about Anthony Calvillo. My pals had endless kudos about his play on the field, of course, but what always seemed to be brought up was his manhood and class off the field. Especially with his family, and devotion to charitable causes. The ultimate Role Model, in an age where they are so needed. His career success is incredible. He is statistically the best-of-the-best in Canadian football, and with three championship rings, he was a first round CFL Hall of Famer – and also a first round Maslow Award winner, of course! But Maslow winners stand much taller than just numbers and awards. Where my personal admiration of this man really came into focus was only a few years ago. My brother Bob, sadly and suddenly was stricken with pancreatic cancer. He was blessed to have spent his last days in comfort at an amazing facility, West Island Palliative Care in Pointe Claire, Quebec. Bob lived for football, almost from birth, and his eyes flew open with disbelief when he watched Anthony Calvillo stroll into his room that afternoon. It was just, “Hi Bob,” from Anthony. The hour he quietly spent with my brother, later presenting him with an autographed football and handwritten personal message, melted my heart. Those of us who witnessed this man's warmth towards my brother that day were completely moved. Afterward, I was able to visit with him and meet his gracious wife, Alexia, and two wonderful daughters, Athena and Olivia. He is a proud papa, and is thrilled his girls are growing up bilingual. He loves multicultural Montreal, and plans to continue raising his family there. I told him I was surprised he wasn't returning to the U.S. to spend his retirement, especially having been a California kid. But, I guess it is a living testament of his love for Montreal, and Montreal's love for him. I took him aside in the lobby, and thanked him for spending time with my brother the way he did. I relayed that Bob was thrilled, and deeply honored to have him visit. Not to be mushy here, but there was something about that moment I will remember forever. How calmly he said it. How deeply he looked into my eyes. I believed him. I believed he was completely touched in his own heart, just to have been able to make Bob Meakin happy that afternoon. Just for Bob. I realized then that Anthony Calvillo is a very special guy. I told him I wanted to write about him in the future, especially to introduce him to people who have no idea who he is. His humility, compassion, and gentlemanly demeanor reminded me of another special guy – the late great Jean Beliveau. In fact, since meeting Anthony, I have described him on blogs as a modern day Jean Beliveau – an incredible sports legend, but also an incredible example of a class act. A true gentleman. And as a final note here, I so look forward to visiting with Anthony Calvillo in Montreal, for a sit-down interview after the Alouettes season is over. I plan on learning more about what makes this gentleman tick. Also, what I have not discussed this time around, is Anthony's tough childhood in East L.A., and his and Alexia's courageous battle with cancer. Those are definitely stand-alone discussions I will write about after the first of the year. 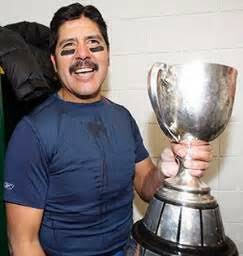 So, trying desperately to not sound too Man-Crushy here, it's so cool to be scheduling a date with Anthony Calvillo. Just a sports junkie's dream, perhaps? Or, maybe just a Writer's Maslow Moment of my own.